Did you know that Thomas Jefferson, often seen as one of the most ardent champions of a limited national government, once proposed the largest single building program of the era and, proportionally, perhaps of all time! Thomas Jefferson is well known for his suspicion about government power. After all, he wrote the Declaration of Independence, and was influential among those who demanded a Bill of Rights be attached to the United States Constitution. But Jefferson as president was much different than Jefferson the political thinker or writer. When he won the crucial election of 1800—what I argue was perhaps the most important election in American history—he tasked his Secretary of the Treasury to put together a massive “internal improvements” program. Albert Gallatin had inherited Alexander Hamilton’s extremely efficient system at the Treasury Department, and immediately looked into programs to build roads, clean harbors, dredge canals, all at the expense of the federal government. What made this all the more surprising was that at that time, all road building was done by private parties and there were virtually no canals yet (the “Canal Era” not starting until about 1819). It took Gallatin a while to get all the information, but in 1808 he made his proposal in which he concluded that “The General Government can alone remove these obstacles” to improving transportation. Now, Americans certainly faced issues in traveling. When the National Road construction began, contractors were allowed to leave “any tree stump less than eighteen inches tall in the roadway”! Gallatin’s plan was a 10-year, $20 million—in a year in which Jefferson’s entire budget was well under $10 million! Jefferson left office before the plans could be submitted to Congress, and at any rate he thought a constitutional amendment might be needed. 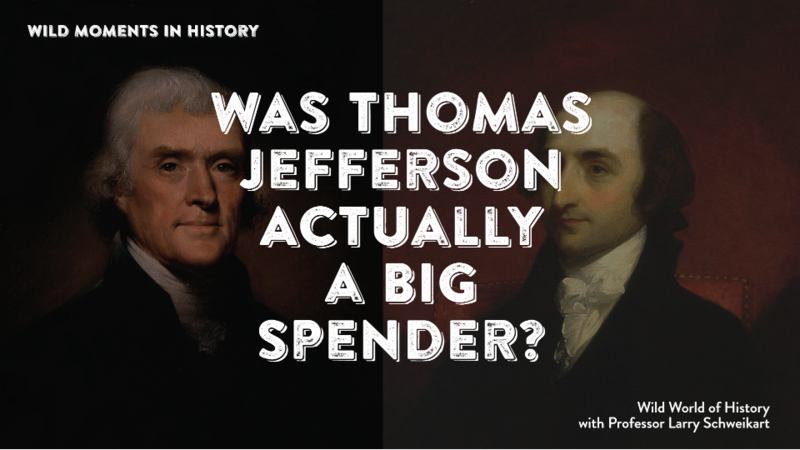 But it is interesting that “small-government’ Jefferson, who managed to reduce the national debt by one-third up to that time, was willing to be the first of the big spenders. For more, see Larry Schweikart, 48 Liberal Lies About American History (That you probably learned in school).